All too often it seems that candidates focus solely on their resume to land the “perfect job”. Yes your resume is important as it gets you to the interview, beyond that it is simply a piece of paper and it is your turn to sell yourself. Present yourself in the best way possible. Below are just a few notes that should help with your next interview. Exude Confidence. Even though you are nervous inside you must show confidence on the outside. This gives a great impression of how you will be able to interact with co-workers, clients and all others involved. Dress Appropriately and Professionally. An interview does not always warrant a suit and tie. Do your research on the company, it’s culture and the location in which you will interview and dress accordingly. That said, make sure your attire is clean, fit and presentable. This has no relation to cost. I have interviewed individuals in an $80 suit that was properly fitted that was just as presentable as another in an $800 suit. Stand Up. When the interviewer enters the room be sure to stand up and offer a solid hand shake while introducing yourself. Make Eye Contact. Make and maintain appropriate eye contact. You want the interviewer to know that you are focused on the current interview and now the birds flying by outside. Be Early. I like to live by the motto that if you are not fifteen minutes early, well you are late. While there are certain circumstances that cannot be avoided but do everything you can to show up to the interview early. This also gives you a few moments to get comfortable in the atmosphere and catch your breath. Be Kind. Be kind to everyone you meet at your interview. Even the first impression of the receptionist can come into play in some organizations. Do not disregard any interaction! Sell Your Strengths. Do not respond to “walk me through your resume” by reading your resume. This is your chance to standout and tell them who you are in a way the resume cannot. Highlight your strengths, your goals and how you plan to make an impact on the organization. Do Not Ramble. Answer the interviewers questions precisely but keep it short at the same time. We do not want to lose their attention. Know Your Target. Do your research before the interview and understand the company and the position you are applying for. Let them know you have taken the interview seriously. Remember that your resume is a piece of paper and you are the product. Have confidence in your capabilities and let it be shown. Research is key. 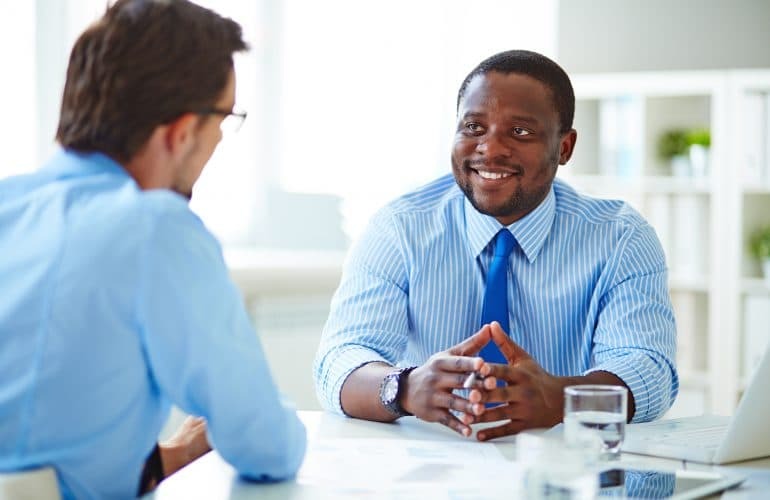 Many candidates show up to an interview without any knowledge of the company in which they are interviewing. Not a good impression to make.